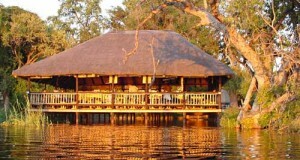 Chobe National Park lies in northwest Botswana and is the second largest national park covering 10, 566 sq km. 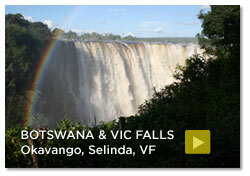 This vast and picturesque area is known to have one of the largest concentrations and variety of game in all of Africa. The park consists of four distinct eco systems: Serondela with its lush floodplains and dense woodlands surround the Chobe River; the Savuti Marsh featuring savannahs and rolling grasslands; the Linyanti Marsh contains woodlands, lagoons, and limitless floodplains; and lastly, the hot dry Hinterland lies in-between the two. The Serondela offers sightings of elephant, buffalo, and bee-eaters drinking from the River. While the Savuti Marsh area is home to various buck species and wildebeest during dry seasons and lion, zebra, and hyena during rainy seasons. The Linyanti Marsh has concentrations of leopard, wild dog, and hippo as well as other rare species. Finally, the dry hinterland is well known for eland. 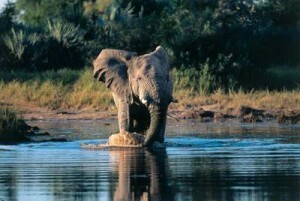 Chobe is best known for its spectacularly immense elephant population. The park is home to roughly 50,000 Kalahari elephants. Spreading themselves out amongst the Chobe and Linyanti rivers, these elephants are the largest in size of all known elephant populations and are an incredible site to see in their natural habitat. During the rainy season, these magnificent creatures can be seen migrating to the southeast stretch of the park. This unique environment coupled with its abundance of wildlife offer a safari experience of a lifetime. 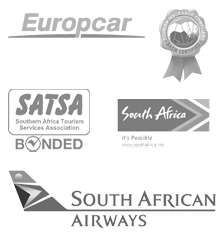 Places to stay that in Chobe that we recommend.